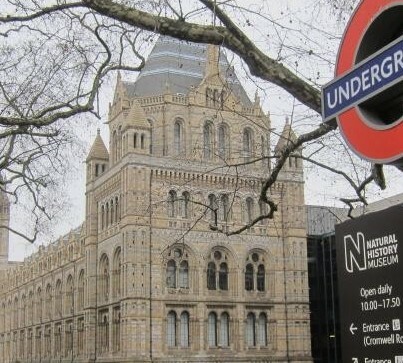 Few of the estimated five million or so visitors passing through the doors of London’s Natural History Museum every year will be aware that a function vital to London’s survival during the Blitz was undertaken within its walls. 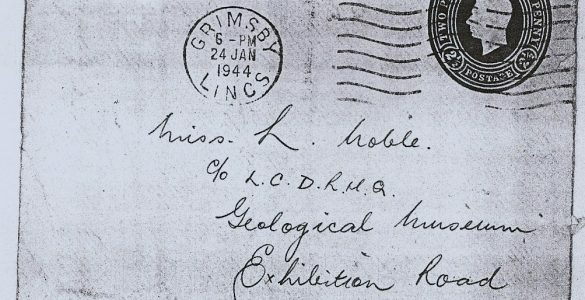 The Geological Museum, now part of the NHM, was, as evidenced by cousin Jim’s ‘familiar scrawl’, home to the regional headquarters of the London Civil Defence organisation. Jimmie Ives’s first job on leaving Southall County School in summer 1939 was as a temporary clerical officer for London Civil Defence at their head-quarters at the Geological Museum, on the corner of Exhibition Road and Cromwell Road, South Kensington. The museum was attached (physically, but not at that time operationally) to the Natural History Museum. The geological Museum had moved from premises in Jermyn Street to its new building designed by Sir Richard Allison and John Hatton Markham for the Office of Works, completed in 1935. An above ground ‘war room’ bunker was ready for occupation by June 1939 to house the control centre for (No 5 Region) London Civil Defence. The location of the bunker and the 1935 facade are now hidden from view by more recent extensions to the south-eastern corner of the building complex. 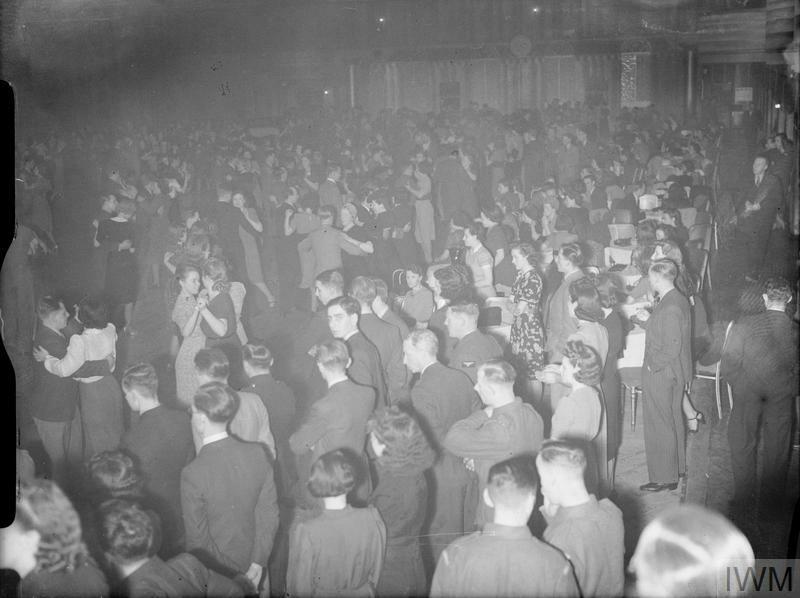 The LCDRHQ control room co-ordinated all the emergency services for Greater London’s 100 CD/ARP sub-districts, recorded all ARP incidents and collated War Diaries, reporting the up-to-date picture of the effects of the Blitz on the whole of London to the Ministry of Home Security. The bunker’s map room was the hub where reports of bombing raids were received and plotted to give an overview which allowed the effective deployment of each of the emergency services. The workforce at LCDRHQ was made up of a large proportion of keen young clerical officers, some of whom were permanent staff members who had taken entrance exams, and many others who had temporary status. While doing their ‘normal’ jobs during the day – Jimmie Ives was involved in the requisitioning of buildings for Civil Defence purposes – staff also took on fire-watching duties and covered the map room outside normal working hours. 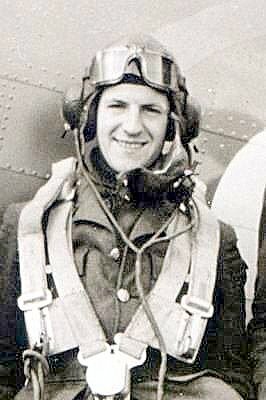 Jim was one of a ‘gang’ of close work-mates who entertained themselves while awaiting visits from the German Air Force. The ‘gang’ seems to have been a number of friends linked with other friends of friends as it seems Peter did not know Jimmie, Lilian or Allan Clifford well but knew Cecil Gardener, Ivy and Alma and Johnny Williams with whom Jim, Lilian and Allan worked and were close. Cecil also knew Sid, Sonny, Eileen Quinn and was a close friend of Johnny Williams too. ‘I still play the accordion and well remember the nights we spent on stand-by at LCDR. At that time I also had drums and the gang would get together while waiting for the air raid sirens to sound – as well we knew they would. There were three degrees of readiness that were set up early in 1940 when it became obvious that the enemy were sending one or two planes towards London with the express objective of setting off all the alarms and effectively shutting down the life of the city. Instituted were three levels of warning. Yellow when planes were detected over southern UK – this alerted but did not trigger alarms. Red when a raid (as opposed to a nuisance intruder) appeared imminent, and purple when it was evident that London itself was the target. The centre was manned (or womanned!) 24 hours a day and during those interminable hours of waiting at the Geological, sleeping quarters were provided and, being a bunch of young people, we had more or less, a perpetual party. The table tennis equipment was always in use and Alma Coombs was a real whiz. Johnny Williams played a backhand style and frustrated us all except Alma. Peter Craske joined the RAF in 1940 and was called up in April 1941. After graduating as a navigator in Canada he was selected for a posting as a long range navigator on the Transatlantic Ferry Command, 46 Group. He undertook 36 Transatlantic crossings including some on the North Atlantic from Montreal to Gander and Prestwick, others on Goose Bay – Greenland – Iceland- Prestwick. Subsequently he was transferred to Nassau flying aircraft through Puerto Rico, Trinidad, British, French and Dutch Guiana, Natal (Brazil), Ascension Island en route to Accra on the Gold Coast of Africa. In 1943 Peter was transferred to the United Kingdom with 512 Transport Squadron at RAF Broadwell in Gloucestershire as a navigator flying Dakotas tasked with paratroop drops and towing troop gliders, including carrying troops of the 6th Airborne Division immediately before and on D-Day. Following the landings and in support of the Allied advance he flew on dozens of missions carrying troops and supplies, including at one period, many trips transporting 2.5 tons of aviation fuel in cans needed to keep the Spitfires in the air. On those trips a nurse was carried on board as return trips to the UK they loaded up with wounded soldiers. As the result, many of those wounded in the morning were back in hospital in Britain by the afternoon. Other Operations included ‘Market Garden’ – the paratroop and glider operations at Arnhem, the crossing of the Rhine at Wesel and at Remagen. All these operations were made in slow, unarmed aircraft. As the Allies advanced into Germany F/O Craske (later F/Lt) was posted to Brussels where the Dakotas contributed in many and diverse ways, literally acting as flying trucks. Prisoners from Belsen concentration camp were flown out to safety – in normal circumstances 20 or so passengers would be carried – the prisoners were so emaciated that about 75 were carried each time to meet load limits. When Norway was liberated Peter Craske was on the second aircraft to land in Oslo and he was also involved in the liberation of Holland. After the German capitulation Peter was transferred to 48 Squadron and went to Burma via Palestine and India to participate in the war on Japan. Stationed in Chittagong, Bengal, he flew in support of the 82nd West African Division and other forces in the Arakans and the Irawaddy Valley from Mandalay in the north to Rangoon in the south, from Akyab on the west coast to China and Siam (as it was then) on the east. When the Japanese finally gave up after the atomic bombings his squadron disbanded and Peter Craske was posted as Staff Officer to Headquarters 232 Group in Rangoon. Thence he was posted to Headquarters South E ast Asia Air Forces attached to Mountbatten’s HQ in Singapore where he was responsible for works and buildings in an area stretching from Malaya to Siam, and from Indo-China to the west coast of Australia for which his experience at LCDRHQ must have stood him in good stead. 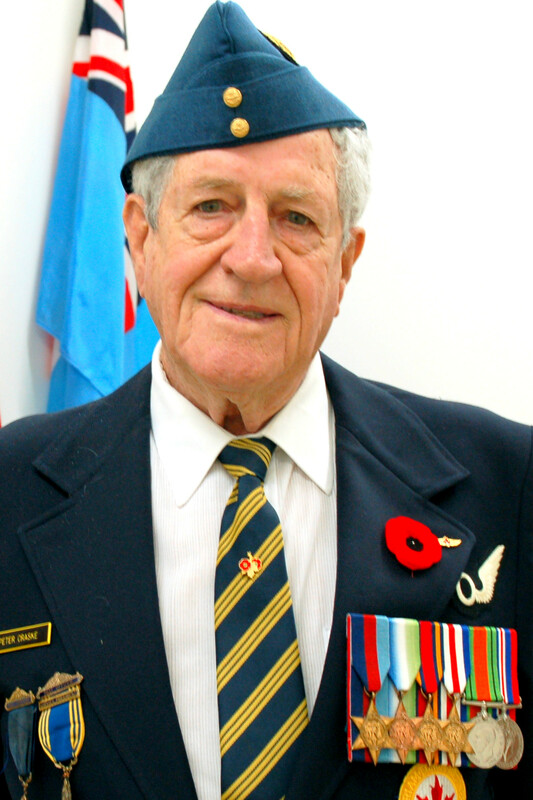 F/Lt Craske was finally demobilised in September 1946 and settled down in Canada to a long career in public relations and advertising for both private industry and the Government of Canada. Prior to his retirement in 1983 Peter was responsible for the advertising of Canadian Tourism in markets around the world. Many thanks to Peter, who is still hale and hearty, for his recollections. On 10th November 2015 he attended the French Embassy where he was decorated with the Legion of Honour for his contribution to Operation Tonga on D-Day 1944. I am the daughter of Freda Willatts nee Beaumont mentioned in your posting and have been in touch with Peter Craske in Ottawa who knew her. I am transcribing three of my parents pocket war diaries do compile a family history.